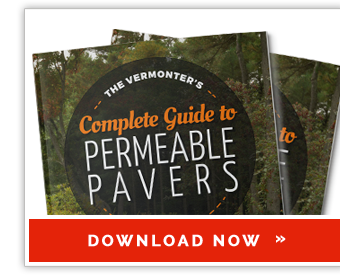 Permeable Pavers vs. Porous Asphalt: What’s the Difference? We may not think of it often, but the pavement we walk and drive on every day has an impact on the environment. Did you know that traditional paving techniques and materials actually cause problems with water runoff and management? Traditional paving materials, such as asphalt and concrete create surfaces that are impossible for water to penetrate. Since the water can’t flow through these surfaces, it picks up oil, de-icing salts, fertilizer, gasoline residue, and other pollutants as it makes its way down the pavement and into the street, lake, or wetland. Permeable paving materials, on the other hand, help manage runoff and control pollutants by allowing rain water/snow melt to penetrate their surfaces and filter into the ground where it belongs. Many different permeable paving materials have been developed, but two of the most popular materials today are permeable pavers and porous asphalt. 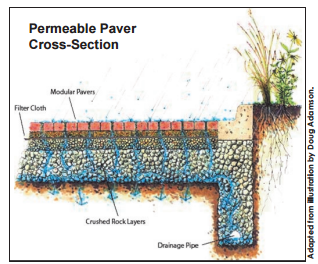 What is the difference between permeable pavers and porous asphalt? Both permeable pavers and porous asphalt serve an important function: they allow storm water to drain through their surfaces into a stone recharge bed and filter into the soils below the pavement. Both materials perform this function equally well, creating a penetrable surface that is ideal for allowing water to move through. Permeable pavers are ideal for sidewalks, walkways, patios, and low-traffic driveways. 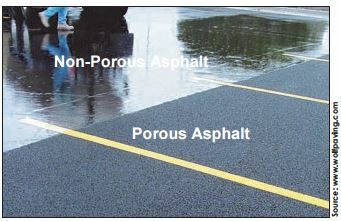 Porous asphalt is better suited for low vehicle weight roads and parking lots. Basically, asphalt or pavers would normally be used, their permeable counterparts can be used. Porous asphalt can be installed in the same manner as traditional asphalt. It does not require any special paving equipment or skills. The difference is that small aggregates are omitted from the asphalt mixture, leaving large, single-sized aggregate particles that leave open voids that give the material its porousness. 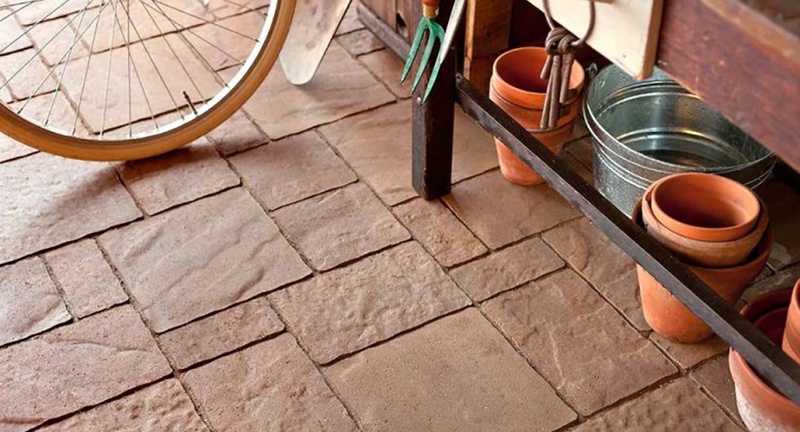 Permeable pavers, just like traditional pavers, can be made from stone, clay, or concrete. They are installed in a similar technique to traditional pavers. When installing both of these materials, a storage or infiltration reservoir is created first. The reservoir typically consists of a layer or crushed rock. Because of the extra materials and time required for these installations, permeable paving is considered more expensive than traditional paving—typically about 20% more expensive. However, that is only the material and installation cost. The savings due to fewer repairs and storm water management infrastructure can’t be ignored. Pervious asphalt is most susceptible to being damaged, especially in a New England climate. It also requires maintenance, because grit or gravel can clog the pores. When this happens, the pavement needs to be cleaned with an industrial vacuum. Unfortunately, if this maintenance isn’t performed on a regular basis, the porous asphalt can start to function more like impervious asphalt. Permeable pavers, on the other hand, are an extremely durable option. Here is a case study about a project Trowel Trades Supply was involved in at Champlain College in Burlington, VT. The college was looking for a hard surface that would withstand the weight of both pedestrians and vehicles, while allowing storm water and snow melt to seep into the ground. The chosen material had to be durable. The college had previously used porous concrete, and the material hadn’t held up after only one winter. Permeable clay brick pavers were chosen as a replacement because of their ease of maintenance and their demonstrated tolerance for exposure to road salt in other cold climates. Obviously, there is a major difference between the look of pavers vs. asphalt. Pavers come in an unlimited range of colors, textures, and shapes, creating the ability to achieve a wide range of styles. Asphalt, on the other hand, is limited to a single look. While porous asphalt is functional, it is more suited to roads and parking lots than to any area where aesthetics are important.